First place awards were made to the Valley of the Sun Clean Cities in recognition of the greatest use of Renewable Biodiesel motor fuel -- and support of the pollution-reducing Phoenix Mass Transit system. 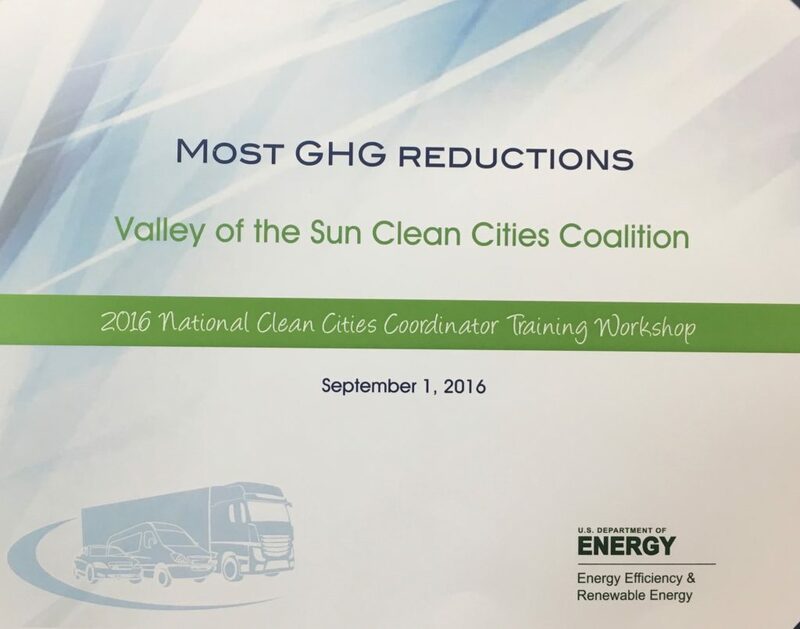 These awards were presented at the Clean Cities Annual Workshop, held at the National Renewable Energy Labs (NREL) in Golden Colorado. They are in addition to earlier recognition as the Coalition that led the Nation in the reduction of Green House Gases. Valley of the Sun Clean Cities left its government home in 2000 and returned as a free-standing non-profit 501(c)(3). It is one of the 95 coalitions designated by the US Department of Energy. The national goal is to reduce the use of petroleum fuel. VSCCC is governed by a Board of Directors with representatives from APS, ASU, The Mesa School District, SRP, The Cities of Phoenix, Scottsdale, and Peoria, Southwest Gas, and a Small Business Man. The Executive Director, Bill Sheaffer held senior management positions with GM & GE. Their focus is the promotion of alternative fuels: Biodiesel, Electric, Ethanol, Hydrogen, and Propane, in addition to mass transit, idle reduction, and trip reduction. It is our developing light rail system. Valley Metro Rail succeeds in taking thousands of exhaust emitting vehicles off the road while transporting them in light rail cars operating on emission-free electric power. Valley Metro Rail is delivering the public a big win with less congestion and ease of transportation. The environment is also a big winner. Using a conservative number of 1.3 occupants per car, the 15.6 million riders removed approximately 12 million vehicles off the road. Construction on the Valley Metro Rail began in 2005. The initial 20-miles opened in 2008. Light rail was necessary to accommodate the accelerating growth in the Phoenix area. The substantial ridership of the “Red Line Bus” helped determine the current path of the system. The system connects to popular destinations in downtown Phoenix, Tempe, and Mesa, including; Chase Field, Phoenix Convention Center, Arizona State University, and Sky Harbor International Airport. Though the light rail is a separate system from the bus system, they operate together seamlessly with a complimentary fare structure, which allows travel on both systems with a single pass. Valley Metro transit bus system continues to expand with the light rail. There are now some 900 buses serving the region. Valley Metro buses also deliver the same dual advantages, taking thousands of exhaust emitting vehicles off the road. They operate on clean-burning natural gas and a few remaining diesel-powered buses are transitioning to low polluting bio-diesel. In the first year of operation, Valley Metro Rail served 11.3 million riders. Due to the expansion of the system, growth in the region and convenience of public transit, ridership nearly hit 16 million in 2016. The current population of the Phoenix Metro Area now exceeds 4.2 million, compared to the early 1900’s when the population was around 29,000. The massive growth in the Valley has resulted in an accelerating demand for public transportation. Since Valley Metro Rail first opened, two more extensions have opened and there are still more to come. Green living magazine worked closely with Valley of the Sun Clean Cities to gain some insight on the new "off the grid" battery pack Tesla is creating.